Welcome to Red Sky Australian Terriers! We are a small breeder of quality Australian terriers, bred and raised to excel in a variety of pursuits. We live in the Kansas City area now. ALL of our puppy parents go through rigorous health testing: Eyes, Patellas (knees), and Thyroid. If you don’t pass the tests, then you are not parents at RedSky. Our 2019 Litters are from parents that have good health testing for at least 4 generations back. Visit our pages to learn more about us and see why a puppy from us could be your next companion, performance partner or conformation champion. We are an American Kennel Club Breeder of Merit and believe in using Puppy Culture practices to socialize our puppies so that they become a great family member. Go to puppyculture.com to see the difference in puppies raised this way. We are planning two litters in the Spring 2019! GCH (Grand Champion) RedSky Total Eclipse (Luna) is a blue tan little girl who will be bred to CH Sundog Clockwork Orange (Alex) who is also blue tan. Since Luna has a red mom, (Fergie), she will be able to have both blue tan and red puppies. We are hoping for March puppies for this litter. CH Redhawk RedSky Purple Heart (Raven) is going to be bred to FCH (Finnish Champion) Reimen Master of Puppets (Dio). Raven also has a red mom, so she will also be able to have both colors of puppies even tho she and Dio are both blue tan. We are hoping for May puppies for this litter. Photos of these soon to be parents are coming soon! We already have several people on our waiting list for puppies, so if you are interested, please contact us by email. If you are really interested, then please fill out our puppy questionnaire on our puppy page and forward it to us! Look what Corrado did the weekend of July 15 2017! Group First (Judge James Fredericksen) and Group 1 (Judge Pamela Peat) !!! This is Ruby. 3 Red girl puppies were born August 6, 2017! All are now in their new homes! News Flash! 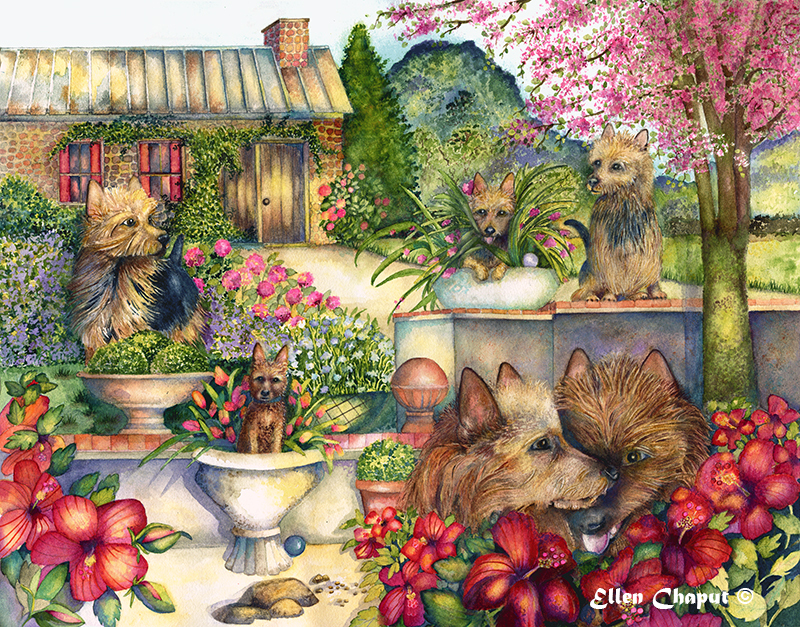 The fabulous aussie art print from Ellen Chaput is here! Please email Ellen at ellcha@yahoo.com for purchase information. Addie is still available for a new home. She is house trained, a sweetheart, spayed, microchipped, registered and has all of her shots!